Datura wrighti, or sacred datura, is the name of a poisonous perennial plant and ornamental flower of southwestern North America. It is sometimes used as a hallucinogen. D. wrighti is classified as a deliriant and an anticholinergic. It is a vigorous herbaceous perennial that grows 30 cm to 1.5 m tall and wide. The leaves are broad and rounded at the base, tapering to a point, often with wavy margins. The flowers are the most striking feature, being sweetly fragrant white trumpets up to 20 cm (7.9 in) long, sometimes tinted purple, especially at the margin. Five narrow points are spaced symmetrically around the rim. The plants often can be seen as a ground vine in habit, growing close to the ground and spreading in a very exposed environment with full direct sunlight (cleared roadside). D. Wrighti, blooms from April through October. In clear weather, flowers open in the morning and evening and close during the heat of the day (depending on water availability); in cloudy weather, they may open earlier and last longer. Datura wrighti is found in northern Mexico and the adjoining southwestern U. S. states, as far north as southern Utah, in open / disturbed land and along roadsides with well-drained (sandy) soils. It is also commonly planted as an ornamental, especially in xeriscapes due to its ruderal qualities. The name commemorates the botanist Charles Wright. Correct spelling since is with one “i”, per ICN article 60C.2. In the US, it is sometimes called “western Jimson weed“ because of its resemblance to Datura stramonium. 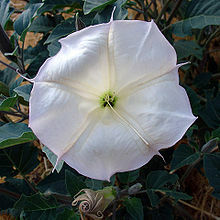 Anglophone settlers in California often called it “Indian whiskey” because of its ritual intoxicating use by many tribes; the name “sacred datura” has the same origin. Other common names include “Indian apple” and “nightshade” (not to be confused with Solanum). The Tongva call it manit and the Chumash momoy. Mexicans call this and similar species tolguacha. or toloache. The scientific name has frequently been given as Datura meteloides Dunal, but this name is actually a synonym of D. innoxia Mill., a Mexican plant with a narrower flower having 10 rather than five “teeth” at the rim. All parts of Datura plants contain dangerous levels of anticholinergic tropane alkaloids and may be fatal if ingested by humans, livestock, or pets. In some places, it is prohibited to buy, sell or cultivate Datura plants. Among the Zuni people, the powdered root is given as an anesthetic and a narcotic for surgery. They also apply a poultice of root and flower meal applied to wounds to promote healing. Datura wrighti is sacred to some Native Americans and has been used in ceremonies and rites of passage by Chumash, Tongva, and others. Among the Chumash, when a boy was 8 years old, his mother gave him a preparation of momoy to drink. This was supposed to be a spiritual challenge to the boy to help him develop the spiritual well being required to become a man. Not all of the boys survived. The Zuni people also use the plant for ceremonial, magical, and divinatory purposes. The root pieces are chewed by a robbery victim to determine the identity of the thief. The powdered root is used by rain priests in a number of ways to ensure fruitful rains. Datura wrighti has also been used to induce hallucination for recreational purposes. Ingestion of plant material can induce auditory and visual hallucinations similar to those of Datura stramonium, with the active compounds being concentrated in the seedpods and roots; concentrations vary widely between samples, and onset is slow. This makes dosage estimation difficult and adds further risk to the administration of material that already has potentially lethal side effects. Scopolamine is the primary active molecule; it is related to atropine, with a similar, largely anticholinergic activity. Effects may include dry mouth, hyperthermia, profuse sweating, decreased sweating, impairment, drowsiness, restlessness, lethargy, psychosis, and anterograde amnesia – along with the afore-mentioned hallucinations and sensory distortions. These compounds also induce a profound dilatation of the pupils and suppress eye saccades, resulting in considerable degradation of visual acuity, often to the point of functional blindness. This may persist, to a reduced degree, for days. The combined effect may result in a panic state in the user, a particularly dangerous situation in someone temporarily deprived of useful vision; users are prone to serious accidental injury. Scopolamine induces respiratory depression at hallucinogenic doses. The combination of anesthesia (in the hospital) and Datura is usually fatal due to combined respiratory depression. Seizures as well as fevers as high as 43 °C (109 °F) have been reported. ^ a b c Cecilia Garcia; James D. Adams (2005). Healing with medicinal plants of the west – cultural and scientific basis for their use. Abedus Press. ISBN 0-9763091-0-6. ^ a b c d e f g Arthur Cronquist; Arthur H. Holmgren; Noel H. Holmgren; James L. Reveal; Patricia K. Holmgren (1984). Intermountain Flora; Vascular Plants of the Intermountain West, U.S.A., vol. 4. Subclass Asteridae (except Asteraceae). The New York Botanical Garden. ISBN 0-231-04120-9. ^ a b c Theodore F. Niehaus; Charles L. Ripper; Virginia Savage (1984). A Field Guide to Southwestern and Texas Wildflowers. Houghton Mifflin Company. ISBN 0-395-36640-2. ^ Preissel, Ulrike; Preissel, Hans-Georg (2002). Brugmansia and Datura: Angel’s Trumpets and Thorn Apples. Buffalo, New York: Firefly Books. pp. 120–123. ISBN 1-55209-598-3.
International Brugmansia and Datura Society – extensive information on species, cultivation, etc.